Surabaya, ITS (Institut Teknologi Sepuluh November) researcher has introduced their innovation about cheap energy source substitution. They named it bioethanol 40 (BE 40). 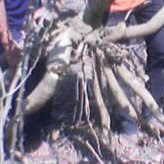 It came from cassava extraction process. Because its efficiency and simple process, it is very easy for many people to use it. Bioethanol is very easy to be made at home, because the main source ingredients can also be easily found at local market. The best ingredient is cassava, because it contains high carbohydrate. Bioethanol can be made with these ingredients also: walur, oil palm, molasses, koro nut, tofu and etc. The process starts with peeling the cassava, well pounded and boiled until it becomes porridge. After it reaches room temperature, pour yeast over. This fermentation process produces a liquid, and after 4 -5 days stored, and add some limestone to increase the ethanol to 95 %, the bioethanol is ready to use. If the ethanol is still under 95 %, it can be explode because of Pb. The limestone is the key to cleanse it. To produce 1 liter of bioethanol, we just need IDR 3.400. The stove doesn’t have a wick and the design was from researcher Fakultas Teknik Mesin ITS. The prototype will mass build with cooperation with Koperasi Manunggal Sejahtera, and each unit is priced IDR 40.000. Bioethanol is very efficient and cheap, but also proven non sooty. The only disadvantage is its warming time, for instance, if you want to cook instant noodles, the cooking time will add extra 2-3 minutes. There have been 30.000 bioethanol stoves distributed to all around Indonesia, 10.000 in Jakarta and outside Java for the rest. Surabaya is their next destination to distributing the stoves. Local peoples will have some introduction on how to create and how to use the bioethanol. enaknya kalo dibakar. dimakan pake kopi hangat.